Nicknames and Stylish Hair: all a day in the life of a bare-knuckle boxer. Take a moment to explore images from the Sporting Portraits collection. This collection contains over 350 photographs, prints, broadsides, clippings, and hand-drawn illustrations from the mid-18th to the 20th centuries. 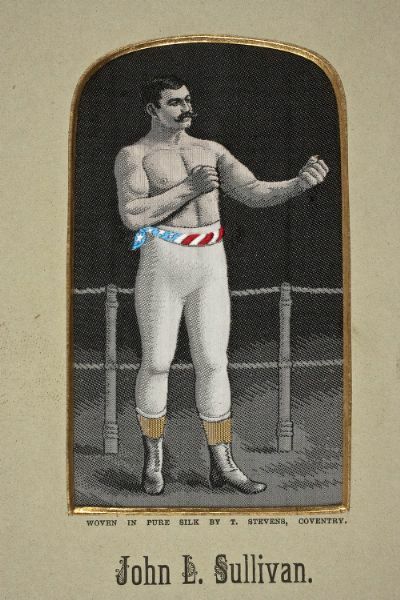 These portraits captured the likeness of more than 100 American, British, and Irish boxers. The nicknames and facial hair alone are worth a look through this collection. Who can resist the classic masculinity of handlebar mustaches? Peter Maher and John C. Heenan wear them well. 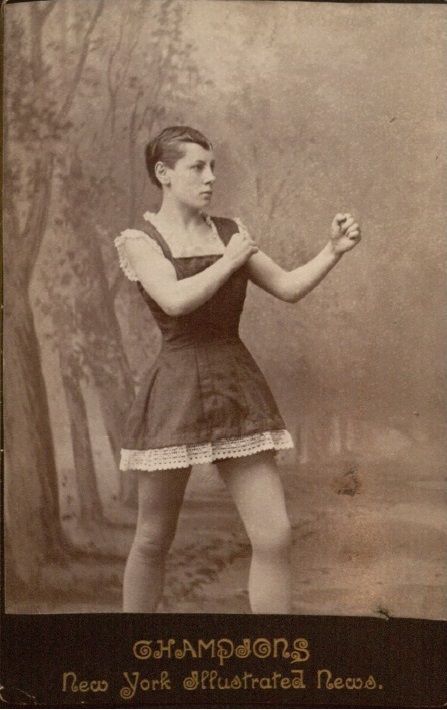 Mustaches aside, a few tough women held their own in this rough sport, one such notable being Bertha Frances. What good is a boxer without an equally intimidating nickname? While only a few images from this extensive collection are available online, the rest are on their way to being digitized. 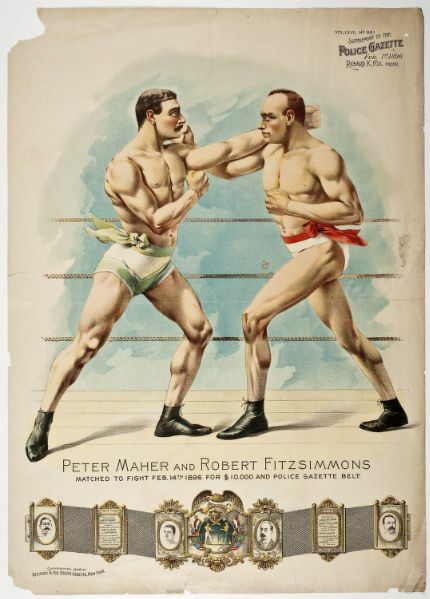 The collection includes examples of excellent craftsmanship– such as the silk embroidered portrait (known as a “Stevengraph”) of John L. Sullivan– and striking imagery, like Thomas Worth’s illustration of the Peter Maher and Robert Fitzsimmons fight. The print is visually compelling even to the most peaceful observer. Thanks to Alexandra Winzeler for compiling this entry and cataloging the sporting portraits! 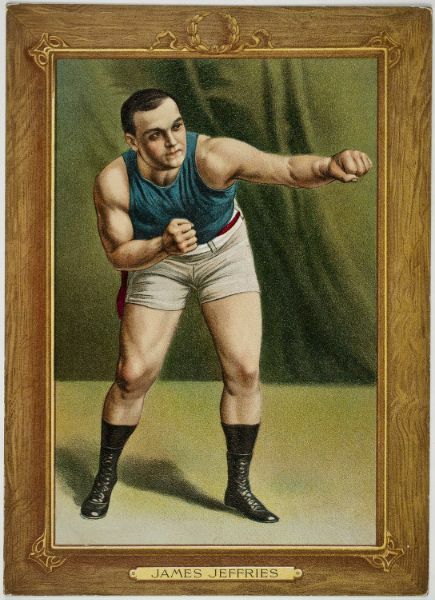 Cigarette cards are among nearly four hundred images in the collection called “Portraits of boxers and other athletes” which in itself represents a tiny portion of the more than seventy thousand pieces to be found in the Portrait Collection of the Fine Arts Library. Evert Jansen Wendell (A.B. Harvard 1882) was an avid sportsman in his student days. In later life, he collected sporting images among thousands of other portrait images and donated them at his death to his alma mater. 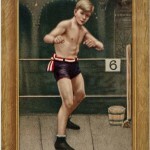 This is an image of a very young blond boy with the relatively unoriginal appellation of ‘Knock-Out’ Brown. 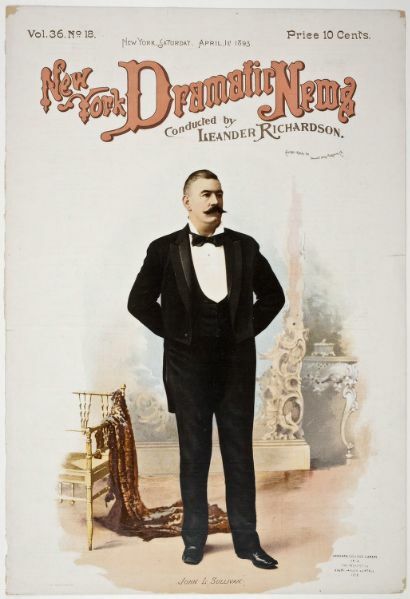 His name was Valentine Braunheim (hence ‘Brown’) and he was born and fought his entire career in New York City. At the time this card was issued (ca.1910), Brown was barely twenty years old and had only been fighting for approximately two years. That he was sufficiently well-known enough to justify this investment on the part of the Red Mill/Turkey tobacco conglomerate indicates that his record (something like four to one in favor of victories at this point of his career) overrode his size (he was 5’3” and a lightweight) as a draw.